Sounding like something created by the propaganda department of the National Rifle Association, Girls with Guns is a 5 reel, 243 ways to win video slot that, you’ve guessed it, is packed full of girls with guns. Created by Microgaming, this military themed game comes with stacked wilds in the base game and a bonus feature that awards up to 30 free spins with 1 wild reel guaranteed. Play from between 30p and £30 per spin. The backstory to Girls with Guns is an A Team style plot that sees our plucky heroines take on drug baron Hector – set against the dense foliage of the South American jungle, the reels include lower value playing cards, Hector’s compound, his gun-toting bodyguards and the man himself in a dapper white suit. They’re joined by the Girls with Guns – Jess the infiltrator, Zoe the tactical ace, demolition expert Alex, sniper Kira, Maria the artillery hot shot and leader Katherine. The Girls with Guns logo is the game’s wild – it can land as stacked on any reel and replaces all other symbols with the exception of the scatter. Look out too for the Charlie’s Angels style silhouette symbol which is a bonus wild. When this lands on the middle reel, it can expand to fill the whole of that reel. The heart-shaped hand grenade is the scatter – land 3, 4 or 5 of this anywhere on the reels and you’ll trigger the Free Spins feature and with it 15 free spins. On each of these free spins, 1 reel will be turned completely wild to give your winning chances a real boost. You can re-trigger more free spins here too so hope to see those hand grenades drop into view – with up to 30 in total possible. We found the variance in Girls with Guns to be in the medium to high range – expect plenty of smaller wins punctuated by something much more explosive from time to time. Visually, Girls with Guns is well put together – the graphics are nicely drawn with the action playing out to a movie style backing track that’s right in keeping with the adventurous theme. We didn’t find the features quite so thrilling. The stacked wilds are a nice touch in the base game and the free spins feature is solid enough. With a name like Girls with Guns, this was never going to be a subtle affair. If you like your action brash, bold and in your face, then the Girls with Guns provide just that. Get lucky with the stacked wild and these gun-toting gals can certainly hit the target. 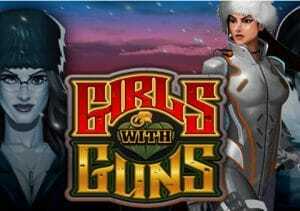 I also recommend you try the sequel, Girls with Guns Frozen Dawn, which is a better game in my opinion.